This week, talks between California state and federal government officials concerning rules for car fuel efficiency standards broke down. Under the Clean Air Act of 1970, California had previously been given special permission to set higher standards for mileage and fuel economy—but now the Trump administration says that only the federal government can set those standards. That SAFE Vehicles Rule, announced under former EPA Administrator Scott Pruitt, would dial back Obama-era goals for fuel economy. Lauren Sommer, science and environment reporter at KQED, joins Ira to discuss what that decision means, and what might come next in the confrontation. Read more about how the talks broke down. Learn more about the SAFE Vehicles Rule via the EPA and the NHTSA. Make your gift today. Invest in quality science journalism by making a donation to Science Friday. Lauren Sommer is a science and environment reporter for KQED Public Radio in San Francisco, California. – This is KERN News. – Saint Lewis Public Radio. – Iowa Public Radio News. IRA FLATOW: Local science stories of national significance that we think are really important to talk about. And one of them is this– for decades California has set its own tailpipe emissions standards for cars, at a levels, sometimes, higher than federal standards. So many cars are driven in California that the standards it adopts are used by 13 other states. So you have a total of 40% of all the cars driven using California standards. 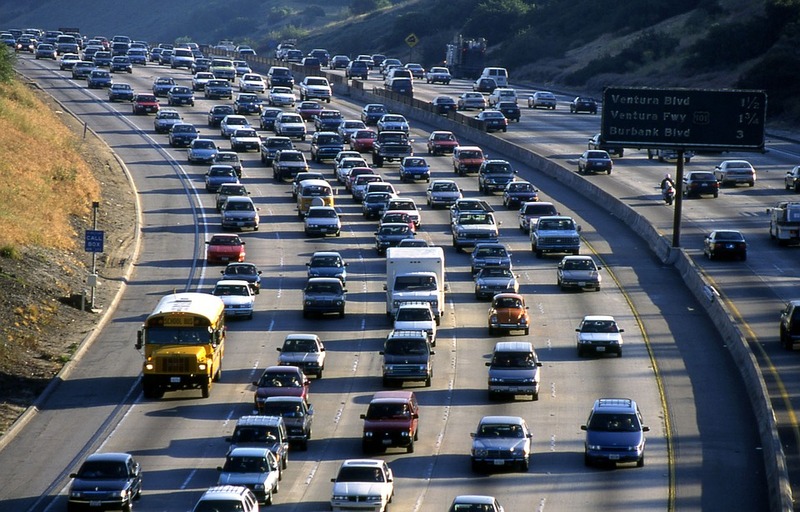 And this week, talks between California and Washington concerning rules for car fuel efficiency standards broke down. The White House said that the Trump administration had decided to discontinue discussions with the California Air Resources Board, the state agency charged with regulating air quality. This is just the latest in a series of challenges that California has brought against the Trump White House. And joining me now to talk about what all that means and what might happen next is Lauren Sommer, Science and Environment Reporter at KQED. Welcome back, Lauren. LAUREN SOMMER: Yeah, hi, thanks. IRA FLATOW: So what’s the back story here? Why did California have different fuel efficiency standards over the national standards? LAUREN SOMMER: It goes back to 1970, a long time ago, right, when California had a really serious air pollution problem. I mean, people saw pictures of LA back then where you literally couldn’t see the skyline at all. And so when the Clean Air Act was passed by Congress, it gave California special permission to have tougher car rules to help clean up their air. And it’s been going on ever since. IRA FLATOW: And these standards are not, as I say, used just by California, right? LAUREN SOMMER: No, I mean, obviously since then, California’s taken on some very ambitious climate change goals. And many other states have been supportive of that as well as kind of this tougher air pollution. So a lot of states signed on to California’s rules. And under Obama, he actually signed on to California’s rules too. So there was kind of this marriage of California and the federal government. And now that marriage seems to be breaking up. IRA FLATOW: Give us an idea of how much tougher were they than the federal standard. LAUREN SOMMER: Yeah, well, it’s a little different. California does it by tailpipe because only the federal government is technically allowed to regulate fuel economy. But what the Trump administration is proposing is that instead of having the fuel economy standards get tougher year over year all the way to 2025, he wants to freeze them starting in 2020. So essentially they would not be getting stricter. And that’s a really big problem for California is what they’re saying. IRA FLATOW: So there is– California is now sort of in another squabble with the White House. IRA FLATOW: They have to build two different cars right? LAUREN SOMMER: It’s a nightmare for them. IRA FLATOW: They don’t want that. LAUREN SOMMER: And so they’re asking actually for fuel economy to get tougher, which is not what the Trump administration wants to do. But so then California’s been trying to talk with the federal government to work it out. And that doesn’t have seemed to have worked at all. IRA FLATOW: Because this week, the Trump administration decided it was done negotiating. LAUREN SOMMER: It was done. And the Trump administration is now telling California it doesn’t want California to go its own route, which has never happened before. California has certainly had disagreements with the federal government over this. But now, the administration is saying, well, even if we don’t have stricter fuel economy, we don’t want you to have your own separate rules. And California’s is very much threatening to sue over that right now. IRA FLATOW: And of course, this is not the first suit that California– the first challenge California is making to the federal government. But you’re saying, like these other suits, they’re going to wind up in court. The courts will be deciding this. LAUREN SOMMER: For sure, this is going to be a really– I think I’ve even lost track of the number of environmental lawsuits California plans to file. But what’s interesting is the science is really going to be important here. The Trump administration is saying that these less stringent fuel economy rules are going to save lives. It’s some kind of interesting process where they’re saying that people will drive more if fuel economy is tougher. And so what’s interesting is the scientists that are actually cited by the federal government have come out and said that they don’t think their research is being used the right way by the Trump administration. And so what the numbers are behind these fuel economy standards and the science is going to be a big point of contention going forward. IRA FLATOW: Why are we not surprised? LAUREN SOMMER: I feel like I’ve talked about this before. IRA FLATOW: And we’ll have you back next time. Thank you. IRA FLATOW: Lauren Sommer, a Science and Environment Reporter at KQED. We’re going to take a break. And after the break, a question that has been plaguing scientists for years, maybe you too. Why do grapes create a fireball when you microwave them? Do you know about that? It’s all over YouTube and scientists have been talking about it. We’ll be right back and talk about the science behind this. This is not something you necessarily want to try at home. So wait to hear us talk about it. And then decide how many ovens you want to get rid of. Stay with us. We’ll be right back after this break. A Climate Tradeoff for Fuel-Efficient Engines? Fuel-efficient direct injection engines are taking over the market for new vehicles. Here’s why they might be an imperfect solution. We have electric vehicles. Their popularity is growing. Does this make green transportation inevitable?